Skied down the west side of Whistler Mt. (not BC... but the one between WA and Rainy Pass, 7790') with Zack and Trevor. Wanted to ski the eastern couloirs but staring up at them after a leisurely breakfast and all set to go, they looked all runneled out. A quick consultation of maps had us driving around to the other side and it looked good! Got a summit in to boot! 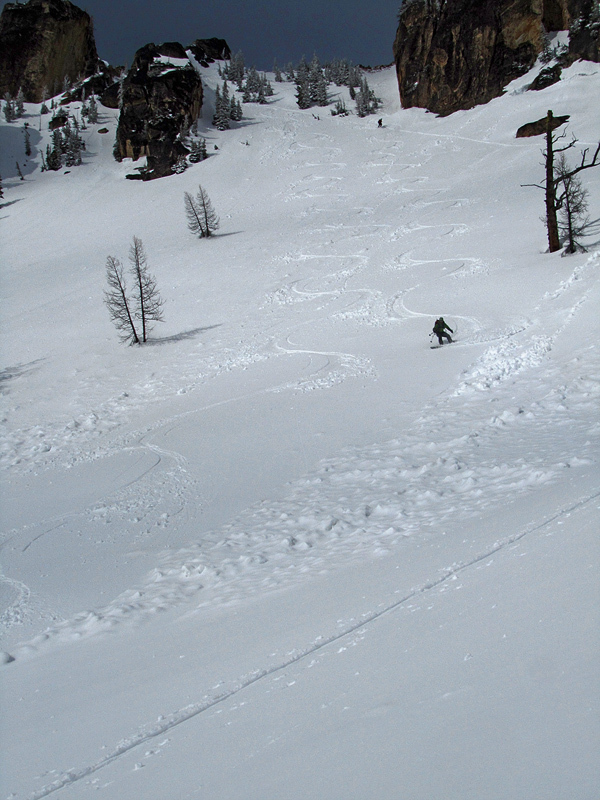 Variable snow, depending on which side of the gully you were on, wind funneling, etc., but no complaints--fun run down!� Interesting snowpack, 3-4 inches on a hard crust above circa 2 feet of wet granular snow... wouldn't want to be up there on a much warmer day. Down low the mornings hard had predictably, turned to mush. Got back down around 1pm, enough time to relax with a beer before hail, rain, sleet and snow... hunkered down in camper van luxury with dueling jet-boils. Once refueled we headed over to WA Pass for tour 2 up a col south of Liberty Bell. Once again totally lucked with the weather, skinning up in sleet and coming down in sunshine. Fun day out - gotta love being able to skin right out of the car! Nice TR! I spotted Whistler Mtn. 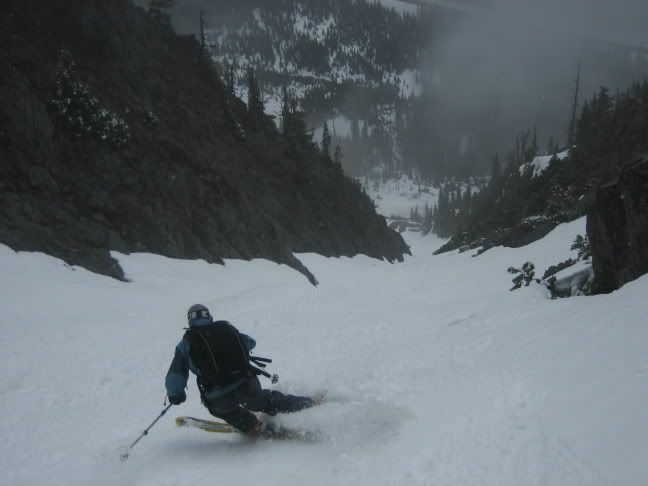 about 10 years ago from the top of the Blue Lake Col and thought what an awesome line that would be. Glad you got it. I especially like the photo looking down at the options...reminds me of Mt. Superior in Little Cottonwood Canyon. Would be interested in seeing a photo with your route up and down. Nice work, guys. Was eyeballing those couloirs while heading up towards Liberty Bell to ski part of Madison Ave and Early Winters Couloir on Monday... those two lines are for sure on the future hit list. Here is a link to some more photos. Including a few on the way up Whistler. All were shot with my android phone so quality is a little lackluster. Way to get out guys. Rule of thumb. If you can see it, it's been skied. 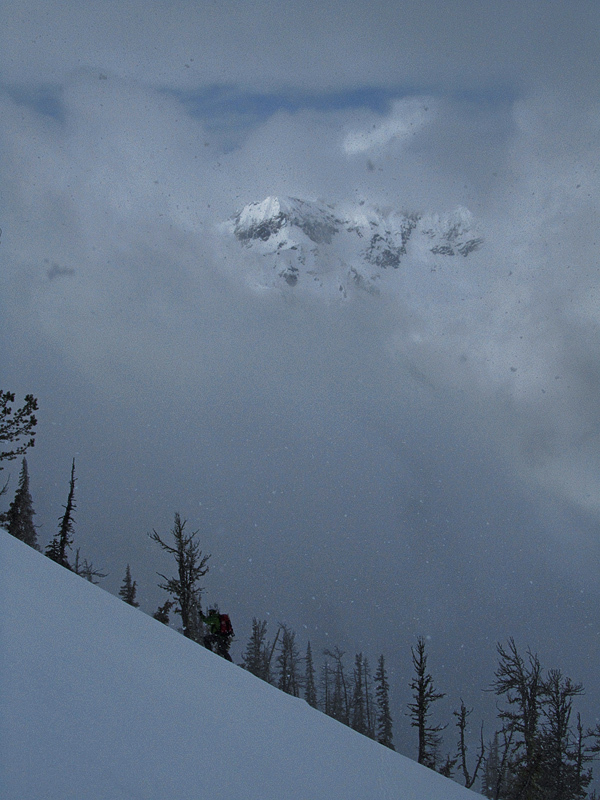 If you can see if from somewhere you are skiing, it's most likely been skied as well. as always though, it's not a complete trip until it's been reported! As far as I can tell if a tree falls in the woods, it fell. No more and no less completely, even if documented on the interwebs. The human factor on the other hand may say "The joke used to be that all of the Hwy 20 lines were skiied by 3 pinners back in the late 70's." Not sure why this is a joke or even why it's no longer a joke ("used to be"). Sounds plausible to me. Whistler would be fun even on wooden planks and a couple of leather straps. Bundle up in furs for full effect! freeski totalamente! the joke is probably because it was skied by some guy in the 50's wearing home made skis with nothing but sinew and hiking boots. really, who cares as long as you are having fun? now that would be impressive, being as SR 20's ribbon cutting wasn't until 1972... and given that sort of an approach, seriously, no joke. These are really cool shots, nice work! 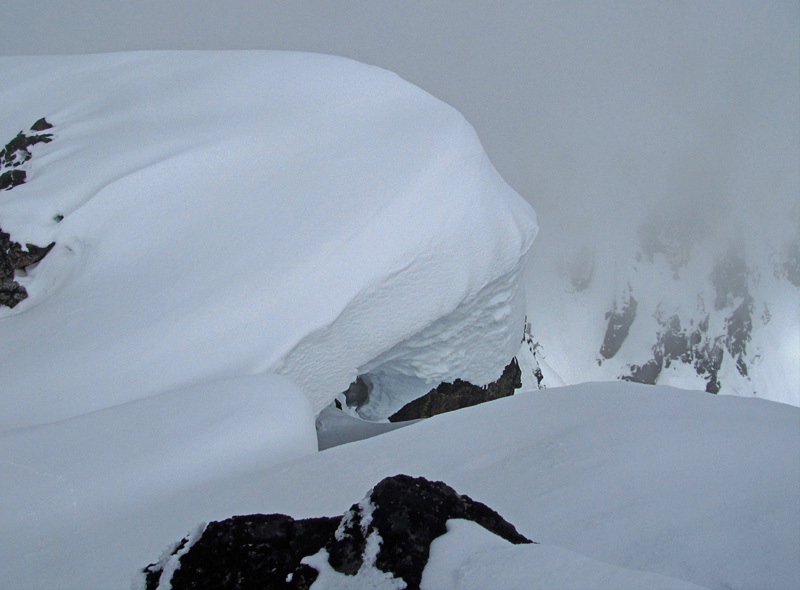 I was checking out the Whistler coulies on Sunday from across the road and pondering just how much snow was still in there.� I was last up there ~5 yrs ago and those lines off the back were really enticing.� �But no leather boots for me. Tell that to Fred Beckey. He often used skis for his appoaches.Saw a 1945 picture of him on Silverstar off now HWy 20. He used leather boots, wood skis and leather and steel binding. As for late 70's Don,Eric,Steve, Dave, Eric, etc. all used pins in late 70's, Most still do. 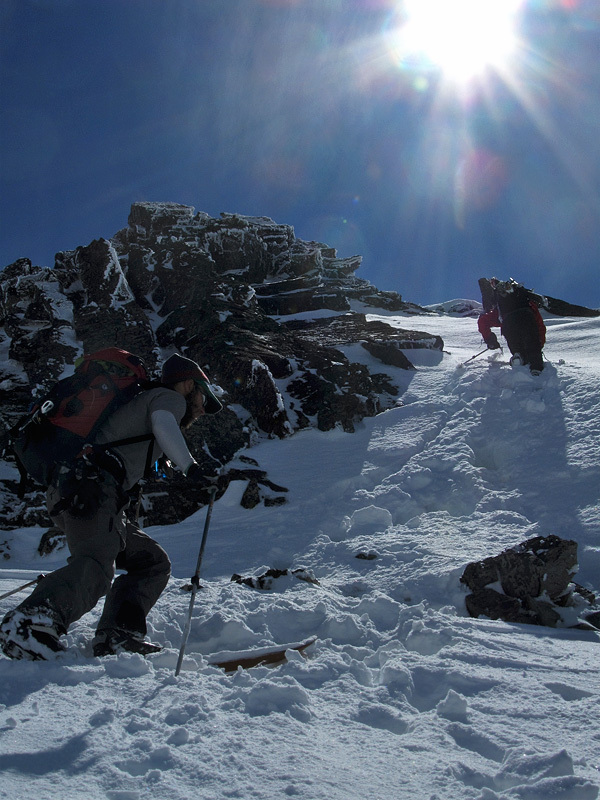 The gear was crappy by todays standard, but those boys were really tuff, no sleding devices for thses guys. 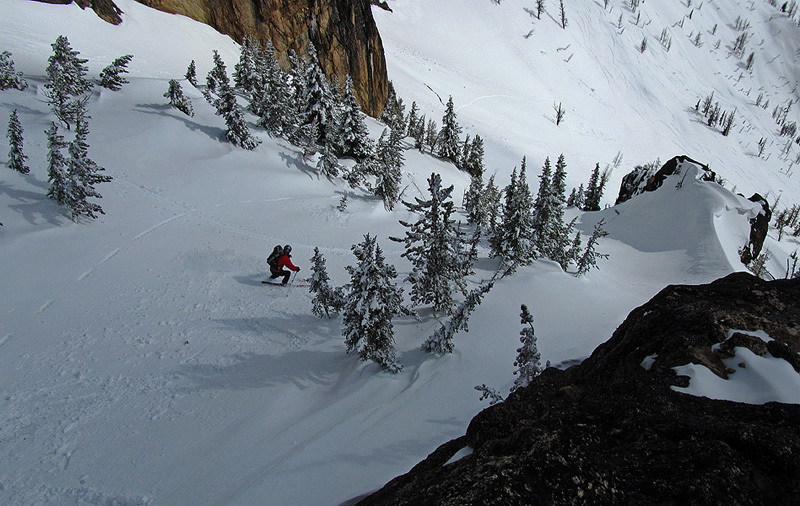 Fred's winter ascent of Silver Star was in 1965, not 1945. 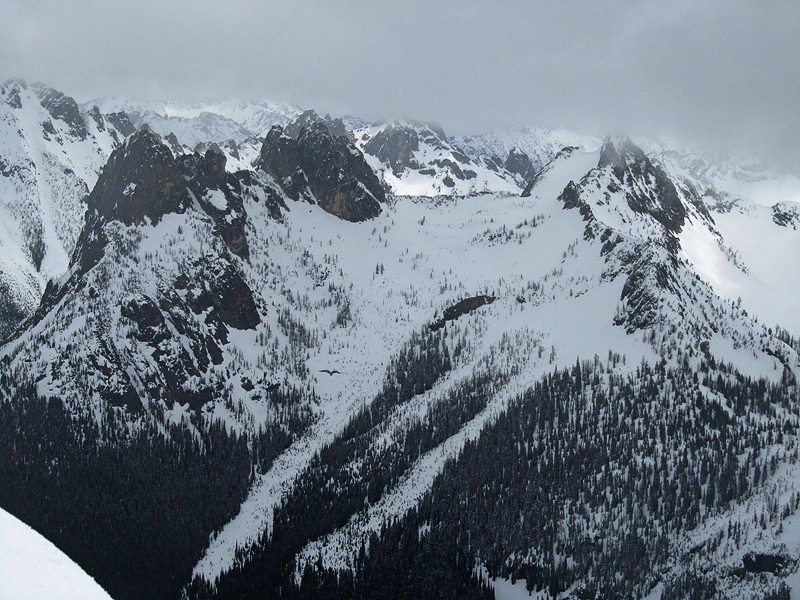 To my knowledge, there was no recreational skiing along the highway corridor between Silver Star and Ruby Mountain until after the highway opened in autumn 1972. I have pictures of Joe Firey and friends skiing near Black Peak in the spring of 1973. I think Joe's crew were probably the first to do much skiing along the highway corridor. 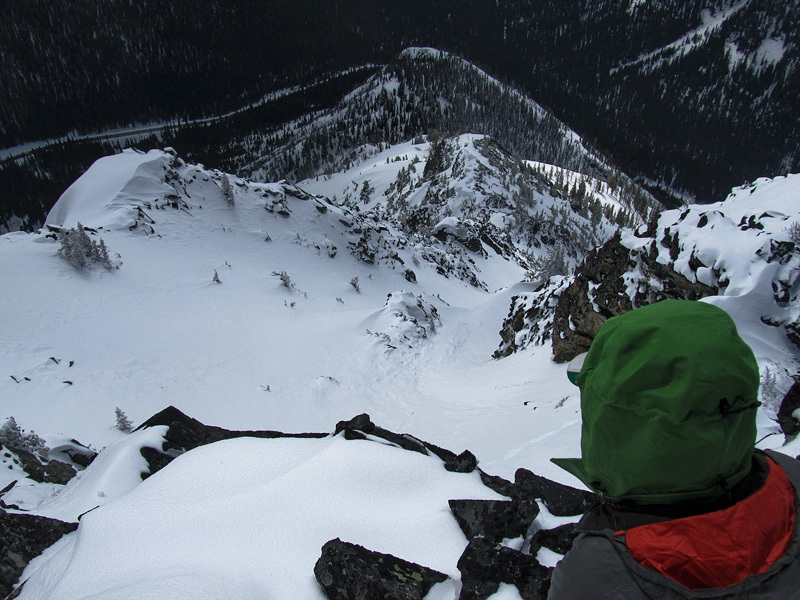 The Methow valley crew started a bit later, but covered a lot more ground ultimately. great shot of the bird shaped creep line over by the spires,.. not sure what they call that slide path..? Lowell,thanks for date correction. Someone told me that you have a website with alot of skier history.Do you have a link. Does anyone know what the courtisy is concerning commenting on TR. with out it being considered a hijack. I don't worry too much about hijacking as long as the thread remains respectful to the original poster and the "hijackers" don't prevent the conversation from returning to its source. Does anyone know what the courtisy is concerning commenting on TR. with out it being considered a hijack. I think in general people are very interested to hear whatever information a trip report generates.� If you do have specific questions then it's probable that others have posed those questions in the past. Nice lines up there! We re-used you skin track and got a few turns in on Monday before the rain hit. Found a single black fleece glove in the uptrack - if it's yours let me know and I can get it back to ya. When we skinned past the "bird" (a big flat rock surface beneath the snow causing separation), two woman were skiing down past it on either side, mother and daughter I believe. Mom scouted ahead and then daughter shredded skiers left of it...� �that's how I remember the "bird"
Found a single black fleece glove in the uptrack - if it's yours let me know and I can get it back to ya. Cool pic Mofro - Thanks! 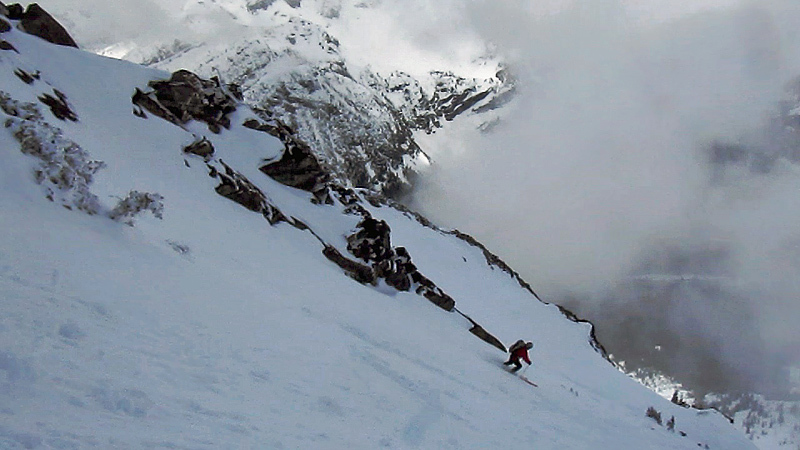 Also, if you happen to have five minutes to blow - a video - of skiing Whistler, that I never added.